On Sunday I ran the Great Chocolate Race in Long Beach and somehow survived 10 miles. As of that morning three weeks had passed since the Disney World Marathon and I’d hardly run at all during that time. I was seriously unprepared for a double digit run, but I was willing to give it a try anyway. Besides, if I missed it I wouldn’t get the promised box of Godiva chocolates when I crossed the finish line! Who cares about medals when there’s chocolate to be earned? 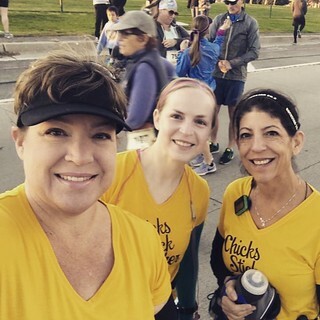 I started the race with my usual running buddies (wearing matching shirts even), but I didn’t expect to be able to keep up with either of them based on the lingering effects of my recent illness. I did end up having a lot of trouble breathing, but I managed to stay with the faster of my two buddies for almost six miles. Not bad! Some of those miles were fast too. Much faster than I planned to run during my comeback. So after gasping for breath during our walk breaks (it felt like I only had about half of my lung capacity available) for far too long I told her to leave me behind. I slowed down significantly after that and stopped for a water break which gave my other running buddy enough time to catch up. Even with a more leisurely pace it was all I could do to keep up with her towards the end! The second half of the 10-mile race was a lot slower than the first half and I was completely dead at the end, but I finished it. It felt really great to get back in to running, especially without any foot pain. I was worried about that, but it turned out perfectly fine. (On the other hand, my knee did bother me a little which is a whole new concern, but I’m still assessing the seriousness of that situation. I’ll evaluate the state of my joints after the Surf City half marathon on Sunday.) And that little box of Godiva chocolates was delicious too.